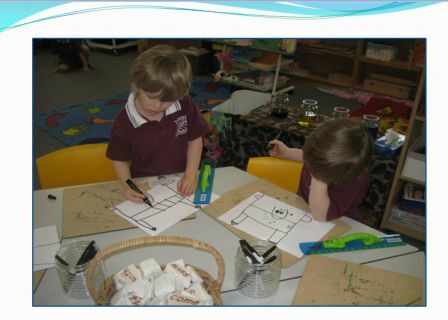 The children thought this was a great idea and plans were quickly drawn up the next day. 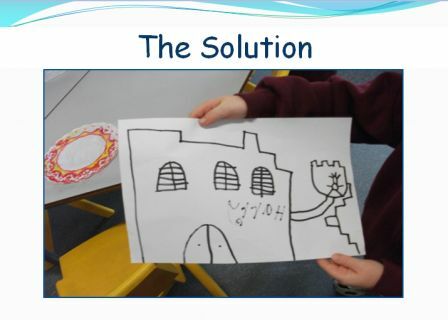 This child drew the classroom castle and included the ramp up to our front verandah. 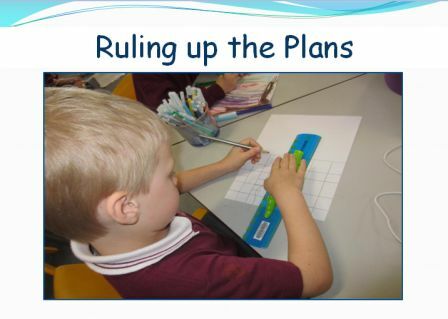 These children used the rulers to measure and rule up their plans. Once the plans were finalised. Construction began. The children chose the grey colour to represent stone. 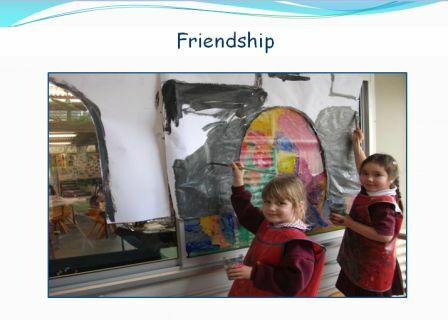 We have been exploring colour and light all term and used this knowledge to make the grey paint themselves. 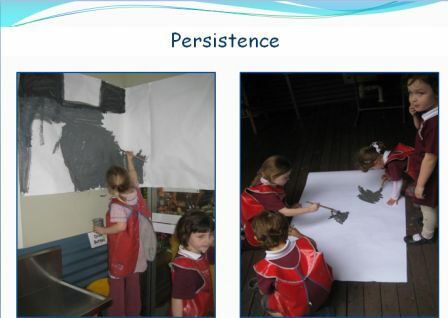 As you can imagine this process required lots of team work and persistence. 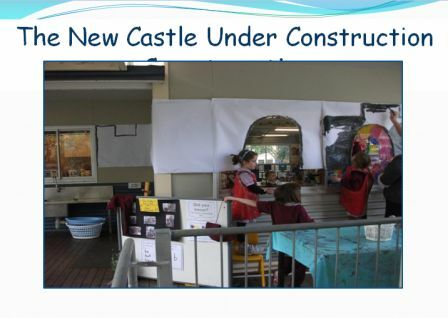 In the slide below you will see the painted windows which we did for Our Many Coloured Days project and were perfect for the castle as stained glass windows. Castle construction is hard work and we wanted to make sure we had everything we needed so lots of research took place using books and the Internet. 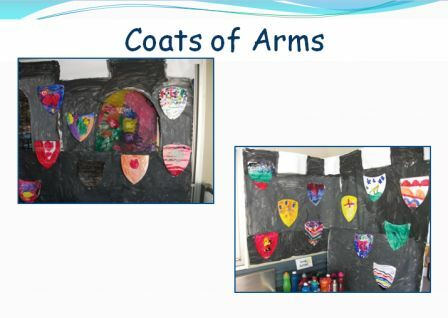 The children observed the Coats of Arms worn by the knights and we discussed their symbolism The children were keen to create their own Coat of Arms and thought carefully about what they could paint to represent themselves. Many children used their initials as well as animals such as lions to represent their strength. It was interesting to observe the children share their ideas about each other and even me. 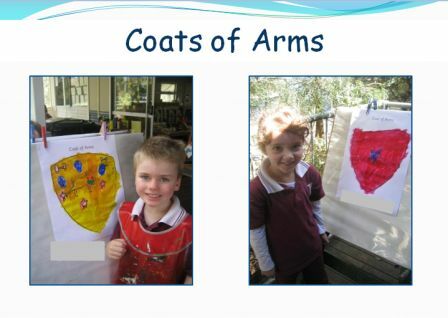 When I asked them what they thought I would paint on my Coat of Arms they said an “L” and “a ladybird because I love ladybirds.” They demonstrated a real understanding of symbolism and of themselves and their peers. When they were dry, the children cut out their paintings and we laminated them. These were then placed on the outside of our castle. Another feature of castles the children were eager to make was a drawbridge. 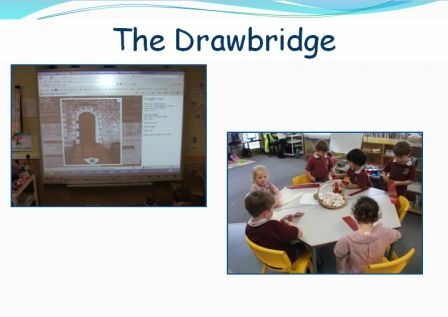 We looked at drawbridge images on the internet and selected the type they wanted to make. 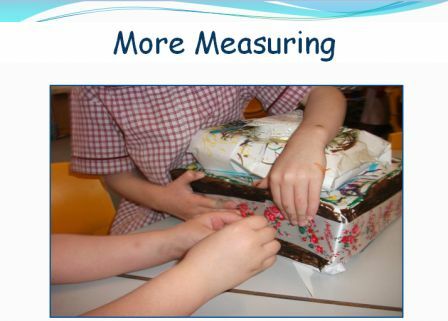 When I first saw this image I immediately thought about using string but the children had other ideas. 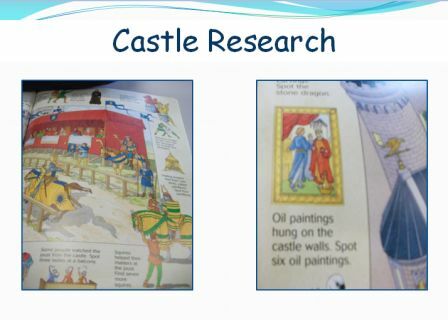 Whilst doing their research some of the children noticed that castles often had large paintings on their walls. 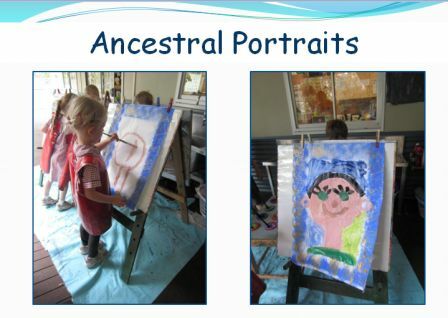 Using this information and knowing that we were having our Father’s Day Pizza and Play night that week, the children painted ancestral portraits of their fathers to hang in the castle. These portraits also had frames that were painted/rolled/printed so that the portraits looked just like the ones in the book. 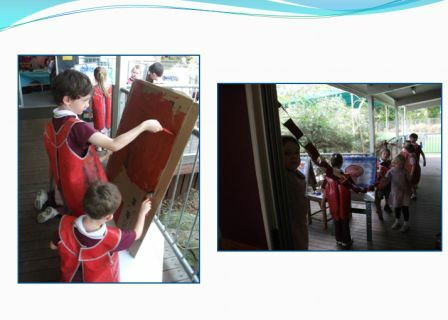 As well as all these activities, some of the children were exploring other ideas of their own. 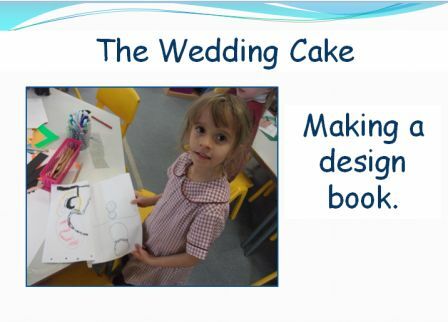 This child was very interested in designing a wedding cake with “lots of layers” and began a design book of cake drawings using lots of shapes. When she went home this particular day she asked her Mum to help her google design images that she brought in the next day. 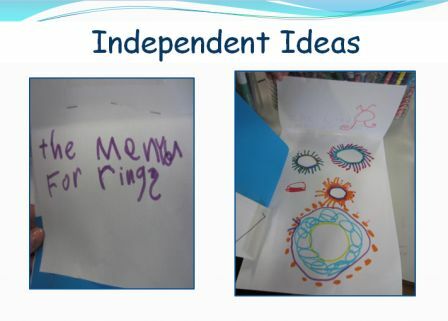 She incorporated some of these ideas into her book as well. 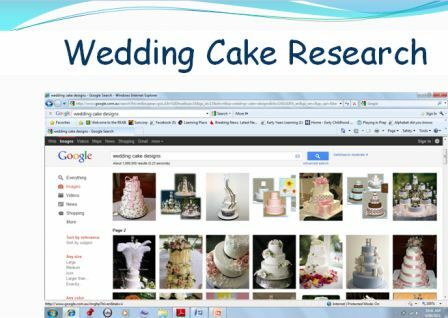 Other children saw her images and asked to google wedding cake designs as well. “Let’s Google it” is a common catch cry in our classroom and the Interactive Whiteboard makes the whole process much easier for the children. With the wedding day approaching,the cake designer became the cake maker with some help from her friends. 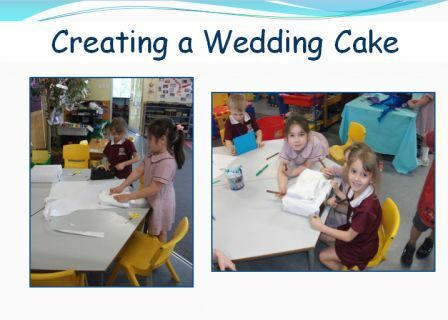 Once again thinking and problem solving, along with measurement was required to cover the cakes. 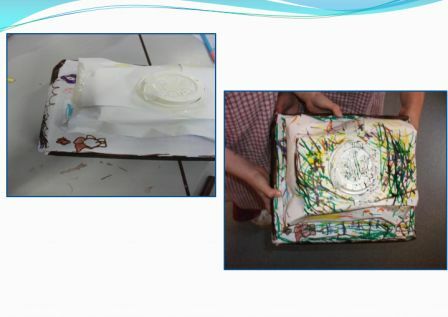 The children became so involved in the process that their original design was forgotten. They particularly loved drawing the sprinkles all over the cake. Please note the circle shaped top layer. From the very beginning, our cake designer was adament that the top had to be a circle and in every design she drew this was a design feature and she followed this through to the finished cake. The final finishing touch – some ribbon they saw a bride adding to her dress. 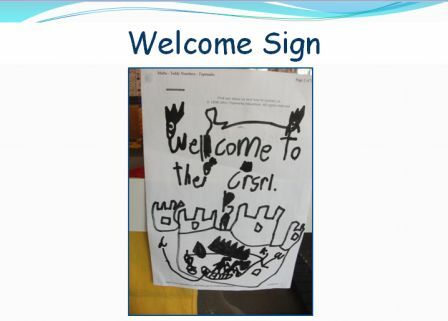 Here is a sign I found on the front door as I was locking the classroom/castle one afternoon. 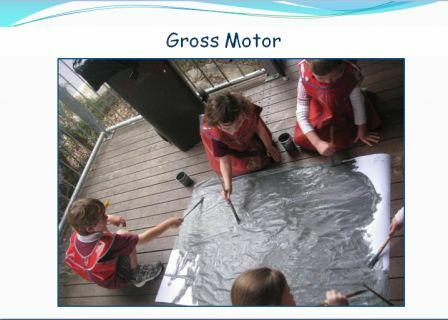 This is the kind of thing that happens when children have ownership over their learning and their play. As I stated earlier, in our classroom if the children need something for their play, they are encouraged to make it themselves with help if needed. Some of our knights decided they needed a trusty steed and made them using boxes and cardboard. It’s a bit hard to see in the photo but the horse is the construction he is wearing around his waist and the part at the front is the head. He used a toilet roll to make the horse’s long neck. 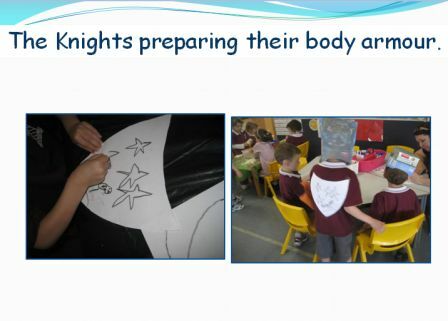 The knights transferred their knowledge about Coats of Arms to add to their armour creations. 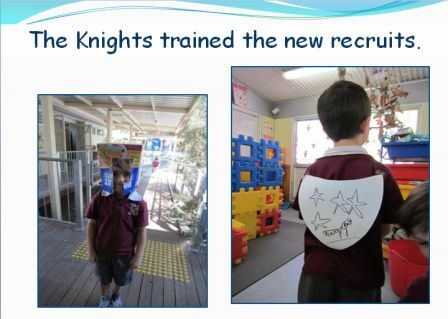 With the addition of more knights, our original guards needed to share the experience and teach the new recruits the ropes. We are now approaching the end of the wedding castle journey prior to the lecture and tomorrow I will upload the next section. Fantastic!!! 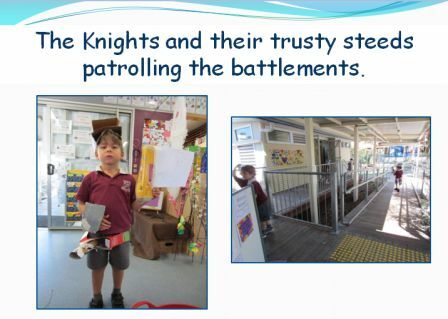 Just the way learning should happen in Prep!! I love it!